Here at our Shropshire factory we’re always busy designing and manufacturing overhead cranes for companies across the globe. As one of the most popular types of crane, portals come in many styles and sizes and our expertise allows us to create a crane that is fully tailored to your company’s needs. In this case, our client required a lifting solution that wold allow them to lift capacities of up to 15 tonnes. Our solution was a fully bespoke double girder electric travelling portal crane. The finished crane’s dual horizontal beams had a span of 8500mm and provided a 9000mm height of lift. These were supported by gantry legs that run on floor mounted rails of 25000mm in length. Overall this gave the system a hook travel distance of 19400mm. A wire rope crab hoist unit which is remotely radio controlled was also specified by the team at Pelloby. The hoist’s cross travel festoon was housed inboard to add extra protection at the customer’s request. The hoist also featured a special rams horn hook with two openings to suit the application in hand. 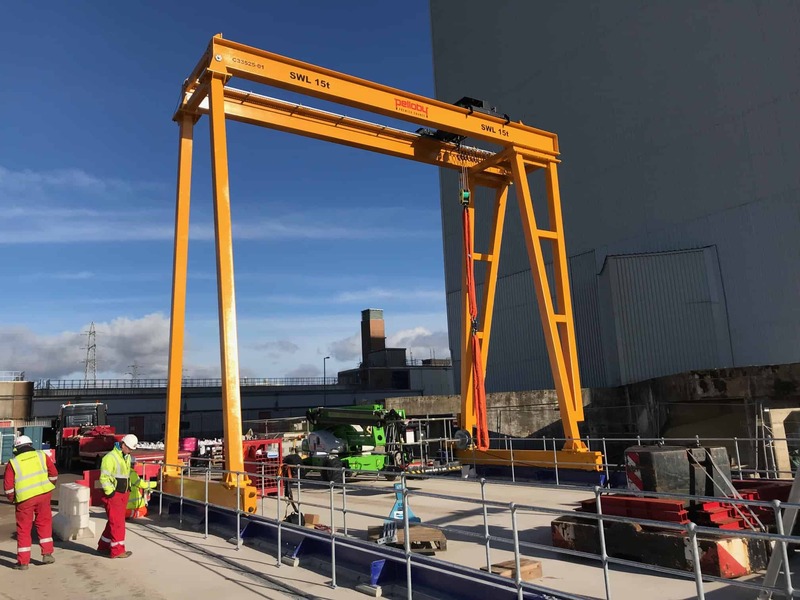 Electric portal travelling cranes are among the most versatile lifting solutions used across a range of different workplaces, including production and energy plants. If you have a particular lifting requirement you would like to discuss with the team at Pelloby get in touch via calling 01952 586 626 or emailing sales@pelloby.com.